Despite Agile’s wide adoption, businesses are still struggling to adopt the mindset, structure and practice of the software development approach. 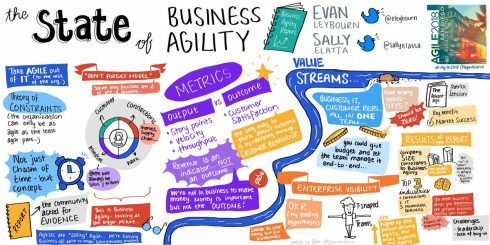 Agile Transformation and the Business Agility Institute announced the first Business Agility Report at the Agile 2018 conference in San Diego this week, which found a majority of organizations still rate their business agility maturity as low, and are struggling with culture and processes. However, despite the challenges, businesses noted they are experiencing tangible benefits from business agility such as speed to market, customer satisfaction, collaboration, and increased employee and customer satisfaction. The report looked at business agility fluency to understand what organizations are doing and how they are performing, top competencies, lowest competencies, how company size correlates to business agility, and perception of business agility. The course is meant to improve knowledge, skill and ability to support teams with new experiences and capabilities. CollabNet VersionOne is officially opening up withs State of Agile survey, designed to gain insight on agile software development and adoption. The survey will be open until December 1, 2018. Scrum@Scale showcased its guide to transforming every aspect of an organization. Scrum@Scale is a new framework that is meant to scale the core of the originally Scrum framework and extend it to tens of teams, hundreds of teams to even thousands of teams. “Scrum@Scale is really designed for business agility. It is designed to go across the entire organization. It is the way the venture group I work with builds scaling into their business and into every investment that they work in,” Jeff Sutherland, co-creator of Scrum, in a video. Zoho revealed the latest addition to its platform, Zoho Sprints. This addition is meant to be a agile project management tool for Scrum teams to plan work, track progress and build products. Features include a backlog, board, epics, timesheets, dashboard, reports, meetings and feed. “Create new sprints and backlog items with a fluid drag-and-drop planning center. Break down the nuances of each user story through epics, estimation points, priority listing, and user assignments. Set durations and timely reminders make releasing after every sprint that much easier,” the company wrote on its website.